I'm a happy member of the Sundays In My City Community (SIMC) by Unknown Mami. Wanna join? Click HERE. And let's be honest, it kinda works with the hair! Check out more Sundays In My City HERE. Creepy, but man, the artist did a great job! That is so cool. 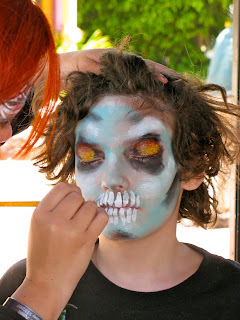 I want to get my face painted. 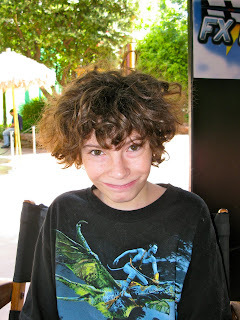 I used to hang out at Universal Studios, but before they had the tours. My dad was a film editor there and my uncle was a special effects cameraman. That is just what my boys would have done when they were young...and I would have been the red faced mother walking three paces behind them. Oh Joanna, you are such a grand Godmother and your Godson is so adorable (very soon he'll be a teenage heartthrob, if not already). The face paint is cool. And Joanna, thank you for highlighting The Sunday Roast. It is quite a woozy feeling to see my name up there at the corner of your blog :) Thank you Joanna and I want you to know that I was impressed with the Sunday Roast because of you. Oh you're right, that does look cool with the hair. I think it's fabulous that he knew exactly what he wanted! I have to agree as well. The hair is perfect! What a great face painting job! This is really fun watching the transformation and it does go nicely with the hair. What did his mom say? OMG -that is the coolest thing, EVER!! I want to do it!!!! You are the best Godmother EVER!!! Oh my! 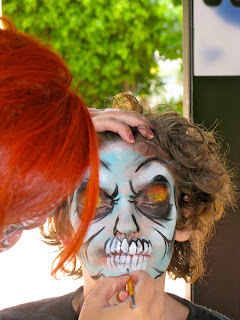 The face painting is amazing! The hair is a nice accessory. He did manage to achieve a wild look! I adore his do,.. Love it! VERY creepy cool! That is so neat! Glad you posted pics, that's incredible! Cool and creepy! What fun little guy! haha! The first few pictures looked like he was going to be the "Crow" from those movies. The artist did a great job and his hair was perfect for it. I hope his mom liked it! It seems like he had a plan and you've got to admire a man with a plan. That last picture is wonderful and it was fun seeing the whole transformation. Great fun! Terrific ! When the teeth came on, I began to like it more!! That's amazing! And yes, the hair is perfect; maybe it was intentional? The artist is quite talented. I'm thinking that you got lots of attention afterward walking around with him. Gotta love boys at that age. 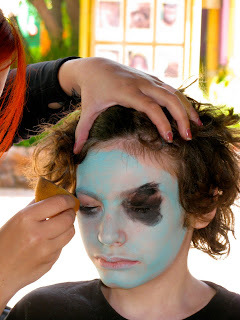 Isn't it amazing how kids all over the world love to have their faces painted!! The painter did an extremely good job!! I love the final result!! 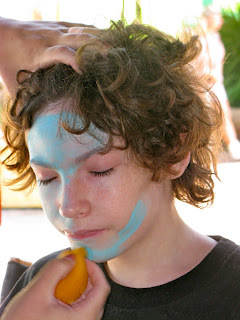 If he's anything like my girls, they never wanted to wash their faces after getting them painted...it just kind of gradually faded away...ick! This is so cool!!!! It was great to see the transformation steps. You are the best to let him do this! 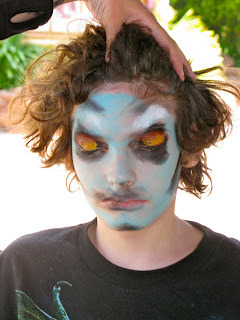 Nice zombie look. I need to borrow that artist for Halloween! That's pretty amazing. There's no way I could do that...that's talent! JJ - I'm so sorry I haven't been on here since I returned home last week; things have been kind of hectic (and a little sad) at the realisation that I'm back. oh now that is a nice paint job! can you be my aunt? smiles. I have to say the hair was enhanced by the face painting. Don't you just love teenagers. He is a cutie! I am glad you didn't have insane crowds on the day of your visit. You are the best Godmother ever! I can totally tell! what a great face - don't know if he is on facebook yet but the last pic would be a good one for it. Don't know how long the vampire thing will be going on with the girls but maybe a dentist would be interested in those teeth. I love his wild hair. a million ~ you deserve a reward! I remember I used to feel this way about going to the park at the end of the street with my kids when they were young. Day in and day out. It does look nice with his hair. The artist did a good job and that was an awesome face paint to have. 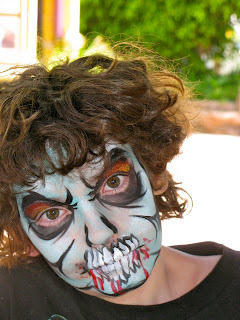 Wow, if I was a kid, I'd want my face painted like that too. Love his hair. It reminds me of my youngest. He can get the craziest hair I've ever seen. Sooo very creepy, just like a boy likes!!!!!!!! Oh what a great transformation! So not what I was thinking...but very cool! I think the artist is talented, thought he looked pretty cool and a little creepy. how would have loved it. What an interesting face painting job! Cute kid too. --My boys often end up with hair like that in the morning. That painting is really cool! That is so AWESOME! he looks great! That is definitely what my boys would have done! I loved that stuff and it was always fascinating to see what they would get. The painting really did go with the hair! He is a cutie! I can take the Blue Line to universal studios from my home in Long Beach. So easy! I love it there!! Your GS is adorable...lucky him. WoW! This is a day he will never forget! You made some good memories! 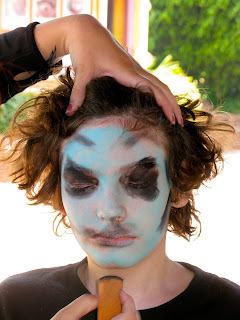 Oh goodness - you had to hang out with that painted face all day?? Well, it's the kid inside that counts, right? LOL It was a great paintjob though. OMG...you had to walk around with him all day!! Great artwork, though! Kids, don't you love em! Great paint job and pics! Woah! That is some alteration! We got a year pass to Universal - it's been fun to take our time & enjoy it (even did Halloween Horror Nights). Thanks so much for stopping by my blog ~ Looking forward to more SIMC!! Looks like something my son would get! Yes, it does go with the hair. She did a great job.. and he's still darned cute!